So this is kind of a blog post but let the record show that it’s just a one time thing, I have no intentions of trying to become a real life blogger. I’ve just been receiving a lot of DMs lately with questions from people about studying abroad / travel so I wanted to create this as a resource for anyone who might benefit! I also wanted to put into words how much I’ve learned in my travels, not just little money saving tips and which cabs to avoid, but also real life-changing shifts in perspective. I do not consider myself an experienced traveler. I’ve only been abroad twice and to one very specific region of the world, which means the knowledge I’ve acquired is very narrow to Europe / studying abroad. But there’s a lot of people out there (especially my age) looking to do just that so here’s some things I’ve learned along the way. First, I need to talk about studying abroad in general. If you’re in college and haven’t studied abroad yet, I want you to know that in my opinion it is the single most important thing you can do in your educational career. And before you stop reading because *insert concern here* let me tell you why it can work for almost anybody. Let me tell ya, I feel this harder than you might imagine. I have faced my fair share of financial barriers when looking to study abroad. I am not surprised when people assume that I have a ton of money because I am able to travel, but it couldn’t be farther from the truth. I am very open about my financial situation, sorry if that makes you uncomfy but I think it’s important to talk about to show how realistic traveling can be even with financial barriers. I am extremely fortunate to have very supportive parents that wouldn't hesitate to help me with money if I had an emergency and who will slip me a 20 for gas here and there and send me back to school with bags of leftovers when I make trips home. However, I have chosen to be financially independent since I moved out for college at 18. As a student, I work 25 hours a week while classes are in session, 40 hours a week during the summer in between traveling, plus freelance photography work on the side. (Also I donate plasma when I can. Easiest money you can make but don't let me get into that.) I pay my own rent, utilities, car payments, gas, groceries, etc. I love the independence that comes with financial independence, but it does get hard. I’m not out here asking for a pat on the back, I’m saying this because it’s easy to assume that because travel is expensive, I must have all this money laying around. But I certainly do not, and what I do have saved, I worked hard for. Now this is where it gets controversial, my secret to affording travel while being a financially independent college student is accepting being broke. Not many people are comfortable living this way, and I understand why. Financial security is very important to most people (and yeah it’s probably a more responsible lifestyle) but at this stage in my life, being a 21 year old with no one depending on me, I value experiences over financial security. I pull off traveling in exchange for struggling all year long and I am very okay with that. That will probably change one day, but all the more reason to live this way while I can. So, if you aren’t that way but want to be, I would encourage you to sit down and evaluate your financial situation, make a hypothetical budget, and find out how much you could save if you REALLY put the work in. HOWEVER, we all know that’s not always enough, which brings me to my next piece of advice. Use financial aid. Yes I know some people don’t like the idea of taking out student loans and going into debt. But the way I look at it is like, when else in your life are you going to be able to take out loans to travel...only when you can say it’s for education! When you are gathering info about a potential study abroad trip, don’t let the big scary number send you away too quick. Take into consideration how much of the program cost is tuition. For example if you learn that a program costs $6,000 and immediately think it’s over there’s no way this could work financially, take into consideration how many credits you’re getting for it. Let’s say you're getting 6 credits for the classes abroad, and one credit hour at your school costs $500, that means $3,000 of that $6,000 total is tuition, and you would be paying that amount for those 6 credits at your home school anyways! Kind of helps put into perspective what the actual trip will cost you when you take out the tuition factor. Budgeting. So, if you are thinking you can pull off a study abroad trip but are nervous about how to budget once you’re there, let me just say you can ask anyone who has traveled with me before, I take pride in my stinginess. I don’t go out to eat out much, maybe one dinner out a week, if that. When I get to a new city I’ll usually find the closest market and buy some things like pasta, protein bars, fruit, etc. and if I’m out and about I eat a lot of McDonald’s snack wraps and gas station pre-packaged sandwiches. I don’t buy drinks from bars that can be 10-12 euros, I buy a 3 euro bottle of wine to sip on before I head out for the evening. I know that makes some of you foodies out there cringe, but it’s those little things that add up especially if you're traveling for an extended period of time. It can be really hard sometimes when you feel like you’re missing out due to trying to save money, there were lots of times this summer that I’d sit down at a restaurant with a group of friends, look at the menu, realize nothing was under 25 euros, and got up and left. But then again, there were also times that I let myself splurge on things that I thought would be a memorable experience. It’s about finding a balance, and if you go into your trip with a game plan about what you value spending your money on and what you don’t, you’ll be a lot more successful at saving. Scholarships. Most schools offer a lot of scholarships for studying abroad if you look for them. I was able to find one specific to my major on my first trip that helped me cut costs. Next, find out if there’s a role you can take on with your study abroad program that would allow you to get a discount. For example, the second year I studied abroad, I took on a position as a student assistant / photographer & videographer which allowed me to work some hours on the trip in exchange for a very significant discount. If you don’t hear of any opportunities like this available for your program, ask. Convince them that you can provide a unique skill that would benefit the program. If you’re a medical student, trip nurse? Use what you have to offer to try to get a discount. Speaking of discounts… student discounts! That same student status that you use to get cheap Spotify premium and free Hulu can score you some major discounts in travels too. STA travel is a website for students to book flights that I have used on my last two trips. They offer a lot of student discounts if you apply for their $25 student ID card. It ends up saving you money in the long run! (Just be sure before you book, you do your research. Once and a while their flights are the same price as on other sites.) Use your student ID for discounts at stores abroad, as well. Not all of them take it but can’t hurt to ask! This is a big problem for students, you go online to your schools study abroad page and click on your major and there’s 1 program being offered in a country you’re not interested in for a time period that doesn’t work for you. That’s okay, you’re not out of options. There are literally unlimited amounts of independent study abroad programs out there that aren’t hosted by your school that you can participate in and then get your credits transferred back to your home university. Just do some research. That’s how I found my program (Forum-Nexus). I literally just googled study abroad programs and found them. Forum-Nexus in particular offers classes on the trip for all majors so all I did was request a syllabus from them, sent it to my study abroad advisor from my school, and got it approved. After the program is over, they mail your transcripts to your school and you get credit. It’s that easy, and a lot of students are really intimidated by the process of getting credits transferred. As long as you stay in close contact with your study abroad advisor and get classes approved before you go, there’s nothing you need to worry about. Study abroad programs are built for inexperienced travelers. Each program is different, but in most cases there is a well traveled professor or guide of some sort there to direct you. They know that most students probably haven’t left the country before, so they prepare you well and take care of you. Usually there are pre-departure orientations / meetings where you can meet your classmates, get advice about what to pack, any safety concerns to be aware of, how to get from place to place, etc. You’ll meet people, you’ll make friends, and you won’t be alone. Remember the first week of freshman year when you move into your dorms and the RA makes you do a whole bunch of annoying “get to know your floor-mates” games? Even though you suffer in agony while you’re forced to share your name, hometown, and major, you really do bond with people at this time because you’re all in the same boat, alone and desperate to make friends. It’s the same with a study abroad program. You’re all coming into it scared and hoping to meet people, so everyone is open and willing to include each other. Finally, if your program is not hosted by your home university, make some phone calls. Study abroad advisors are used to getting calls from parents and students asking every overly concerned question in the world, that’s their job so don’t be afraid to speak up and ask about whatever might be holding you back. Okay this actually can work, depending on your situation. Obviously college athletes don’t really have an offseason but there are options! Study abroad trips come in a range of time periods. There are programs as short as 2 weeks long out there which would be perfect for an athlete who doesn’t want to be out of training for long. Also, this is kind of a stretch but these days a lot of people are taking 4 and a half or 5 years to graduate. If you know that you are going to graduate late you could use the time in which you are still in school but have used up your 4 years of eligibility to go abroad. I think that's how it works… let me know if I’m mistaken. But also you could look into where to train while abroad. If you’re staying at a host university, it’s likely they have facilities available for you to train at which would be a good way to make sure you can come back and still compete in your sport. SAME. I personally chose a program that travels to 5 countries and 9 cities in Europe over the course of 5 weeks, which worked out perfect for me. But, if you find that your options limit you to one destination, just know that (at least in my experience in Europe) it is so easy to travel on shorter excursions once you’re there. Most study abroad programs have free weekends, which is the perfect opportunity for a trip to a nearby city / country. For example, after my week in Paris, I took a train to London for the weekend. We traveled there on a Eurostar train (amazingly easy and decently priced) and stayed in an Airbnb once there. It’s a great way to see multiple places especially if you’re afraid of committing to one place to study. European countries in particular are so small especially compared to what we’re used to in the states. Like literally the whole country of France is smaller than Texas. So it makes it really easy to just hop on a train and go to another country, and that way your one destination trip can turn into a multi-country experience. Okay so now that we have shut down all of your potential concerns (at least the most common ones) let’s talk about the benefits of studying abroad. Besides the fact that it’s the most fun time of your life, here’s some reasons why I think it’s beneficial / necessary for everyone to experience. We get really stuck in our bubble sometimes, especially in the routine nature of college. Getting outside of what’s comfortable teaches you to be flexible, it puts you in uncomfortable situations and shows you how to make them work. To have that figured out this early in life will make the rest of your life smoother. If you haven’t experienced culture outside of what you grew up with in in America, it’s a life changing experience. To be an outsider really brings down the ego you didn't even know you had. It puts into perspective that we are all equals, and that we only think things are right and wrong based off of what we are accustomed to, not because they are actually right and wrong. When you’re in your home country, I think it can become really easy to subconsciously look at foreigners or people who don’t speak English as being outsiders. It sounds absurd, but really if someone doesn’t fit into your culture, it’s difficult to fully accept them in and bond with them. But when you step into a new city where you’re the outsider, you don’t know the language, you don’t know how their transportation system works, or even cultural norms like how to order at a restaurant, cross streets, etc. it’s very humbling. You realize that your way of doing things in life is just one of many, and that none are better than another. I wish for everyone to have that experience. I can't tell you how many good friends I’ve made and special relationships I’ve built with those I met while abroad. Sometimes it’s the other students on the program. You get REALLY close to people when you travel together. Early mornings, long flights, studying together, partying together, for a long period of time...you’ll make lifelong friends with the people on your trip. Sometimes it’s local people at a restaurant you visit, sometimes it’s the professors you network with and that help you open doors down the road. 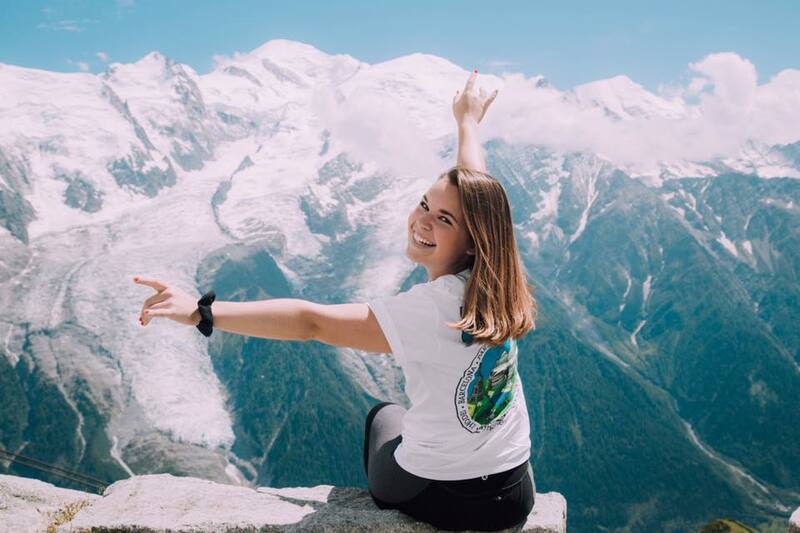 There’s so much to learn from other people, especially ones that are different than you, and studying abroad is one of the best ways to experience that. There is no time to travel like when you’re in college. Because it’s productive! If you travel after college when you have a full time job, it’s called vacation. Because your travels don’t have a purpose other than entertainment! It’s harder to justify personally, financially, and to a boss approving your time off. Also, a lot of people want to get married and start to have families within a few years after graduation, and if that is the direction you choose for your life you might find yourself with very limited time to travel. 5. Kickstart the rest of your life. Studying abroad in my experience really kickstarted the rest of my life. You get to college and you start to experience this freedom and independence by making choices for yourself, handling money, scheduling classes, making career choices, etc. then as soon as you start to get comfortable with all that, studying abroad takes that to the next step, throwing you into a new country and culture to figure out those same things all over again. While abroad, you start to see more options for potential career paths, you may be inspired to learn a foreign language, you may network with someone who becomes a great future connection, you can put it on your resume help to stand out to future employers, it really just kickstarts you into the rest of your life. My time studying abroad has been the most amazing part of my life and I have only really been able to articulate a fraction of the amount of passion I feel for this topic. If there is any part of you that has a desire to do it, I would encourage you to just take the first step. Lots of study abroad offices offer "first step meetings" where you can literally walk in and be like “I have no idea what to do right now but I’m interested” and they’ll be like alright we got ya. So just do it, if it doesn’t work out for you to be able to go then at least you’ll know you tried. And if you do go, I promise it will change your life.